This colorful pictorial map of Yosemite Valley was drawn by artist Jo Mora in 1931. It shows many humerous scenes and shows the activities common at the time in the Valley. Many landmarks are shown in an amusing way. For example, a cloud resting on an easy chair is shown for Clouds Rest. A bishop is straddling the Cathedral Spires. The map was purchased by my grandmother during a trip to Yosemite during the depression. Use of this map is subject to the disclaimer below. This map is large (2101x2691, 2MB), so look at the map size if your Internet connection is slow. The original map is roughly 13x17" (33x43cm) and printed in color 1941 and 1949 by Yosemite Park and Curry Company (despite the 1931 copyright date). This map has been reprinted by the Yosemite Association (1996, enlarged to 18x24" or 46x61cm). An earlier map, printed 1931 in black and white by Jo Mora, was limited to 2000 copies and measures 20x26". The black and white has additional features that were later removed, such as the Sentinel Hotel, Zoo, and old Big Oak Flat Road. Artist Joseph Jacinto Mora ("Jo Mora") was born in Uruguay in 1876. After moving to the United States, he studied art in the East, then worked for the Boston Herald as a cartoonist and illustrator. Mora came to California in 1903 to see an old friend in San Jose. In 1904 he lived in the Oraibi Hopi village and photographed and sketched the Hopi people. In 1907, he marred Grace Alma Needham and they moved to Mountain View, California. In the early 1920s he moved to Carmel to be near the Carmel Mission and work on a commission for a sarcophagus for Fr. Serra. In 1922 he moved to Pebble Beach where established a home and large studio. 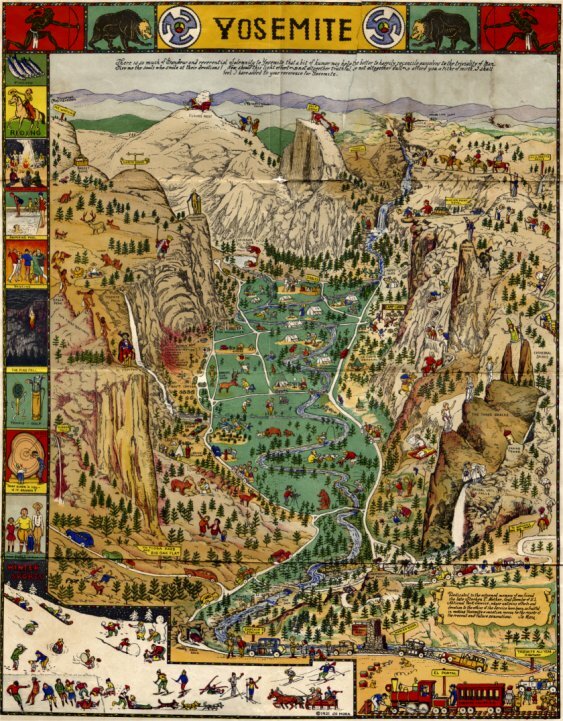 The Yosemite pictorial map was drawn in 1931. Joe Mora also produced a similar pictorial maps for the Grand Canyon, California, Los Angeles, 17 and Mile Drive. He also produced posters "Indians of North America," and a poster "Sweetheart of the Rodeo" showing evolution of the cowboy from the Spanish Conquistador to the modern rider. and He published three books. A Log of the Spanish Main, Trail Dust and Saddle Leather, and Californios. Jo Mora died in Monterey, California in 1947. We provide this historical map as a free service. Historical maps, by their nature, are not accurate nor up-to-date. These maps are provided "as is" in the hope that it will be useful, but WITHOUT ANY WARRANTY, to the extent permitted by law; without even the implied warranty of MERCHANTABILITY or FITNESS FOR A PARTICULAR PURPOSE. This map was copyright 1931 by Jo Mora, but it does not appear to have been renewed when required, in 1958 or 1959, so may be in the public domain. However, I do not warrant this information. Use at your own risk, especially for commercial, non-educational purposes. Copyright © 2004 Dan Anderson. All rights reserved. Last updated 4 April 2019. If you have questions or comments, please send a message to Dan Anderson.